(In Photo – Left to Right) Rutledge Mollander Jr., David Russell, Tom Fagnant, Walter Goudie, Milton Lizotte, Rutledge “Ray” Mollander Sr., and Frank Maxcy. 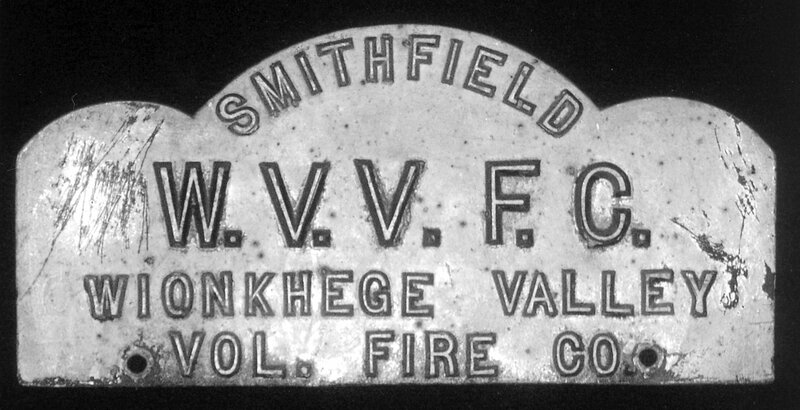 Many paid fire departments across the country can trace their roots to volunteer fire companies, and Smithfield’s fire department is one such example. 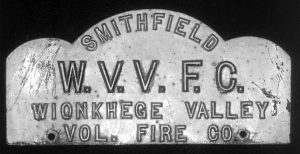 Before there was a “Smithfield Fire Department”, the town was protected by two volunteer fire companies; one in Greenville, the other in Georgiaville. Few may realize that there was also a third volunteer fire company that protected the Wionkhiege Hill and Wionkhiege Valley portion of town. Although only in existence a relatively short time, it was a hotly contested aspect of Smithfield’s fire-fighting history. In the 1950s, Smithfield was still considered to be a close-knit, New England town. The villages of Greenville, Georgiaville, and Esmond, were well established commercial centers with much of the rest of the town still farmland and apple orchards. During the later part of the decade, the Wionkhiege part of town experienced an increase in growth prompting some who lived in that area to lobby for the creation of a new fire district. The proposed Wionkhiege Valley Fire District would service roughly eighty-five homes that were located within a two mile radius of the Latham Farm, which was located near the intersection of Log and Burlingame Roads. Area residents felt that better fire protection was needed due to the distance they lived from the Georgiaville and Greenville fire stations, as well as the narrow, twisting, roads leading to the area that would hinder a fire engine’s response time. The plan wasn’t to eliminate the need for the other fire companies, but to simply shorten response time and slow a fire’s progress until fire engines from Greenville and Georgiaville could arrive. The driving force behind the proposal was Mrs. Corielynn Latham, the only woman to ever organize a fire company in Smithfield. She began her project by going door to door asking for monetary donations to start the company. 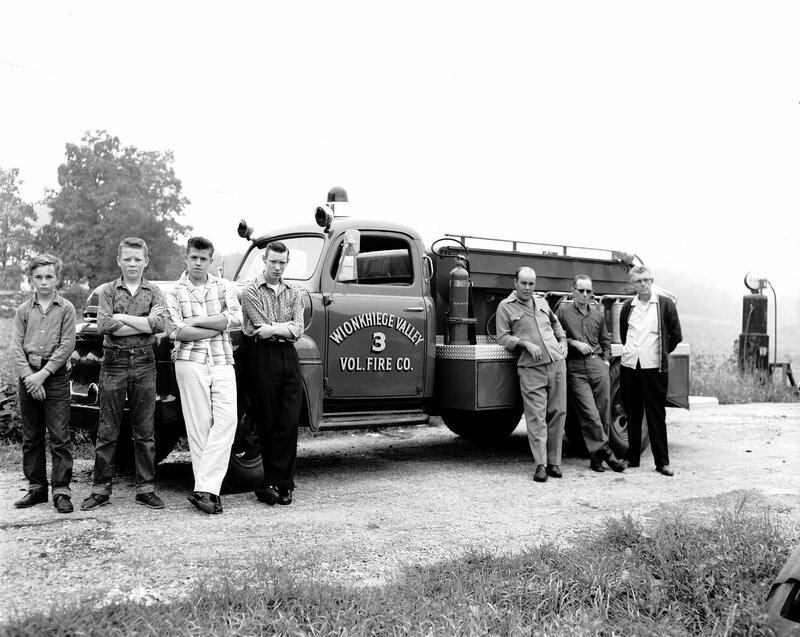 When enough money had been raised, Secretary of State John A. Notte granted a charter for the formation of the fire company, and in the second week of September, 1958, the Wionkhiege Valley Volunteer Fire Company was formally established. A garage that once stood on Log Road at the intersection of Burlingame Rd. was used to house the company’s fire trucks, and the first company meeting was held there at which time company officers were elected. Daniel W. Latham was elected president; William Martineau, vice president; Edward Jacques, secretary; and Harry Gardner, treasurer. Mrs. Latham, Mrs. John Mura, Rutledge Mollander, Hugh Brown, Walter Goudie, Ralph Farrar, and Charles Campbell were all elected to serve as a board of directors, with Mrs. Latham and Mrs. Mura also serving in the ladies auxiliary. This cast aluminum plaque once adorned a volunteer fireman’s vehicle. The new fire company held a square dance three weeks later to raise funds for equipment. Before long, the W.V.V.F.C. purchased a second-hand Ward LaFrance pumper truck from Richmond, Rhode Island. Members of the company also hand-built a custom Ford tank-truck which carried eight-hundred gallons of water. Volunteers also created twenty cisterns throughout the district from which the pumper could draw water in the event of a fire. The new firemen received training from Lt. Ronald R. Jones of the Cranston Fire Department, as well as courses in first-aid and lifesaving from the Red Cross. Things seemed to be going well. Wionkhiege residents had the fire protection they were seeking, and the town gained two additional pieces of fire apparatus that could be called into service if needed. Yet surprisingly, not everyone was in favor of the new fire company as evidenced by newspaper articles of the era. There were those who claimed the added fire protection wasn’t needed, and actively sought to have the W.V.V.F.C. abolished! The issue wasn’t personal, but political, and residents and officials from all sides weighed in. In 1961, voters were asked to decide if town funding should be granted to the W.V.V.F.C. to allow it to continue operating. Despite some objections, voters granted funding. Yet the debate continued prompting members of the Town Council to request a comprehensive study as to the necessity of having a third fire district in town. The study was conducted by the Smithfield Planning Board, which released its findings in early 1962. The report also recommended a fire engine capable of pumping 500 gallons of water per minute, a suitable fire station in a central location, and the installation of a fire alarm system that would simultaneously ring at both the Engine Company station and the Greenville fire station. While some viewed the report as a victory, others saw it as a contradiction, for there already was a fire station with two fire engines in the area. The Wionkhiege firemen decided to fight back, and on May 10, 1962, two days before the Town Financial Meeting, the following letter appeared in The Observer. It has been a year since the people of the Town of Smithfield voted their approval of expending funds for the operation of the Wionkhiege Valley Fire Company. The Volunteers of the Company are extremely grateful for this recognition and have sought to spend their appropriation wisely. As you know, this appropriation was voted by the people in spite of the Town Council’s stand that we did not need fire protection in this area. This year, however, the Council has changed its position in view of reports from the Planning Board and the New England Fire Insurance Rating Association. Having been enlightened by the experts, their position is that we should have a permanent station, a new pumper, and other equipment in accordance with N.E.F.I.R.A. regulations. This is more than we planned to ask for on our own and naturally has great appeal. However, the Council has sought to take away from us our greatest asset. Their recommendation is that we eliminate the Wionkhiege Valley Fire Company and be swallowed up by the Greenville Fire Company. Our finances, personnel matters and general administration would be taken over solely by the Chief of the Greenville Department. In effect, we would lose our identity. This would kill the spirit which has carried us along to where we are; and the one most important asset of a volunteer organization is spirit. Once that is lost the organization slowly falls apart. We are therefore appealing to you, the voter, to continue your faith in our work, and give us our appropriation, or any portion of it you feel is proper, after hearing the discussion at the meeting. But, don’t be a party to our downfall and give our appropriation to the Greenville Company. All we ask is the opportunity to govern ourselves in the American tradition. Give us this opportunity by giving careful consideration to our request from the floor at the Town Financial Meeting on May 12. The letter was signed, The Volunteer Firemen of the Wionkhiege Valley Fire Company. Despite their best efforts, the Wionkhiege Valley Fire Company was forced to disband. Following the Planning Board’s recommendations, the town built the Log Road fire station, (Today known as Station 3), which opened in June of 1964.